What is the buoyant force? This buoyancy calculator is a simple tool that lets you determine the buoyant force in a blink of an eye. All you have to do is provide the density of a fluid and the volume of an object that stays underwater, and it will use the buoyancy formula to estimate the force that keeps the object floating. If you are wondering how to calculate the buoyant force by hand, don't worry - we've got you covered! Buoyancy, otherwise called the upthrust, is the force acting in a direction opposite to gravity that prevents a floating object from sinking. When the object is immersed in water (or any other liquid), its weight pulls it downwards. Buoyancy opposes that weight and has a magnitude directly proportional to the volume of liquid that would otherwise occupy the space taken by the object - in other words, to the volume of the displaced liquid. B is the buoyant force. 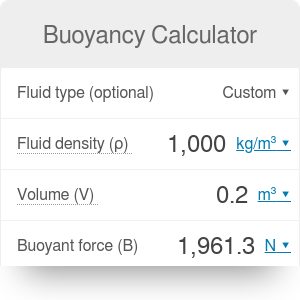 Our buoyancy calculator has a default value for the gravitational acceleration set to 9.81 m/s². If you want to change this value, open the advanced mode. Decide on the gravitational acceleration in the place you want to measure buoyancy. If you immerse the object in a liquid on Earth, you don't need to make any changes in default values. Let's assume, though, that you wish to perform an experiment on Mars. Then, the gravitational acceleration will be equal to 3.24 m/s². Choose the liquid you want your object to be immersed in. Let's say it is salted water with a density of 1020 kg/m³. Place the object in the water and measure the volume of the displaced liquid. For example, let's say it is equal to 0.03 m³. Buoyancy Calculator can be embedded on your website to enrich the content you wrote and make it easier for your visitors to understand your message.